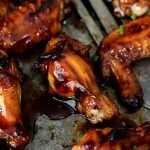 Easy baked sticky chicken wings with a delicious sweet apricot glaze is the perfect game day snack and easy family recipe. Combine all the glaze ingredients in a saucepan and bring to a simmer. Cook until the sugar has dissolved and the glaze has reduced slightly. Remove from the heat and allow to cool to room temperature. Place the chicken wings in a large bowl then season with salt. Pour over half of the glaze and stir to coat the chicken wings well. Transfer the chicken wings to a rimmed baking sheet, leaving some space around the wings to ensure they caramelize well. Use two sheets if necessary. Place in the oven and allow to bake for 30-40 minutes, basting with the glaze every 15 minutes, until the chicken wings are cooked through, sticky and caramelized. Remove from the oven and serve with the remaining glaze for dipping.